Gunfire on soldiers as they tour northern border. None hurt. 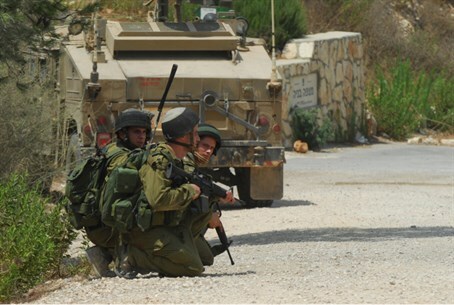 An IDF patrol came under fire Thursday afternoon in the northern Galilee, near the border with Lebanon. The soldiers returned fire. No IDF soldiers were hurt in the incident. Additional troops were called to the scene. It is not yet clear who opened fire on the soldiers. It is believed that Lebanese hunters may have fired over the border by mistake. Tensions have been high on the northern border following a series of cross-border incidents involving Syria. In some cases, fighting within Syria spilled over the border with misfired shells hitting Israel; at other times Israel was deliberately targeted. Last Friday an IDF patrol was targeted in a bomb attack in the Golan. The bomb damaged an IDF jeep, but did not cause casualties. Tensions rose further following the assassination of a leading member of Hezbollah - an attack claimed by Sunni Muslim extremists but which the Iranian-backed terrorist group blamed on Israel, prompting Israeli officials to warn Hezbollah against attacking the Jewish state in response.